Rok compared to Presso, any word yet? Thread: Rok compared to Presso, any word yet? I have been patiently waiting for word on this forum about the replacement to the Presso, the ROK. If I had one wish for my two Presso machines it would be increased robustness, especially of the central plastic plunger and sheath. This is something which has been promised in the marketing. A hardier machine will mean more confidence to do finer grinds and higher pressure shots. I damaged two Pressos before I got a sense of their physical limits. The first time i cracked the plunger which caused a fountain of hot water to shoot up and hit me. The second time I noticed damage to the plastic tabs on the outer cylinder, which hold it in place in the aluminium sheath. Luckily I got a warranty replacement in the first case and the second time was able to purchase replacements of my plastic parts. Has anyone made the purchase yet? My other question would be, does your old Presso basket fit the ROK? That would be neat as I have a Presso naked portafilter which it would be great to reuse. Only Rok I know is the VW Amarok??? There was some noise a while ago about presso arms getting broken but they were always swapped under warranty. Might have been a suss batch as mine seems solid. They are also claiming the plastic plunger is strengthened. I would have liked to see change to the plastic cylinder anchoring onto the metal sheath too but they haven't mentioned that. Also no info on whether the portafilters are interchangeable with the presso. I would post a link to the source for my info but this seems to make my posts disappear into moderation oblivion. Looking forward to seeing a user report from someone with presso (breakage) experience to know whether the upgrade is worth it. I bought a ROK today seems to make a fine coffee,will take it camping. after reading the threads,I followed your instructions and my coffee improved(I bought mine from the coffee guys at woolowin) went down nicely with a couple of baked scones,thanks for all input on this net. May not use it just for camping,my home machine is auto Jura also makes good short blacks. Howdy Coffee Snobs. Great to see lots of discussion around the ROK (formerly Presso). 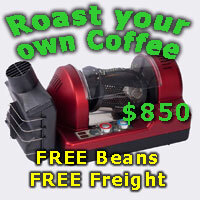 We have put together a very good special for the ROK, Porlex hand grinder and some fresh roasted beans from Green Cauldron. Here is a link to the special. For CS members the special can be even more special. 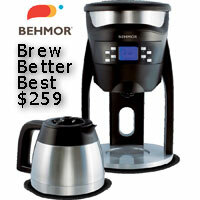 Enter coffeesnob15 for another 15% Off. It's worth it. I broke my Presso a while back, and it was months before I got an replacement arm. The new, stronger material will be a welcome change. Hi, I'm in the UK, I got a new plunger to replace my Presso plunger, which functioned with no problems for 5 years, but is letting some air through now. The new reinforced improved (yes, they did!) plunger is now half a millimetre too thick to fit into my Presso. They suggested I "file it down". I suggested they send me a part that fits, as I don't have a sander, bench clamp, air substraction, i.e. a workshop, to make that work. New to the grinder world, is Aldi a dirty word ? How much better is a behmor compared to a popper? The Word for today !